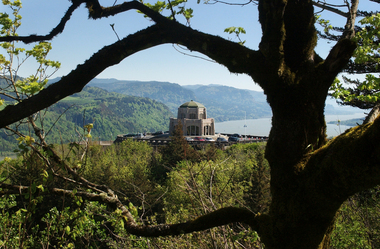 Oregon Live alerted readers to the reopening of the Vista House on top of Crown Point on the 21st. Read an excerpt below. The road to Crown Point and Vista House reopens Friday, just in time for the Memorial Day weekend, thanks to the near-completion of the viaduct restoration project. The project began last summer, forcing closures on the Historic Columbia River Highway. The Oregon Department of Transportation said occasional lane closures will be needed in June as crews finish the project. The 600-foot-long viaduct surrounds Vista House. Crews have had to restore the viaducts support columns, which were deteriorating. Without that, the road would not have been able to handle heavy vehicles such as tourist buses and RVs.